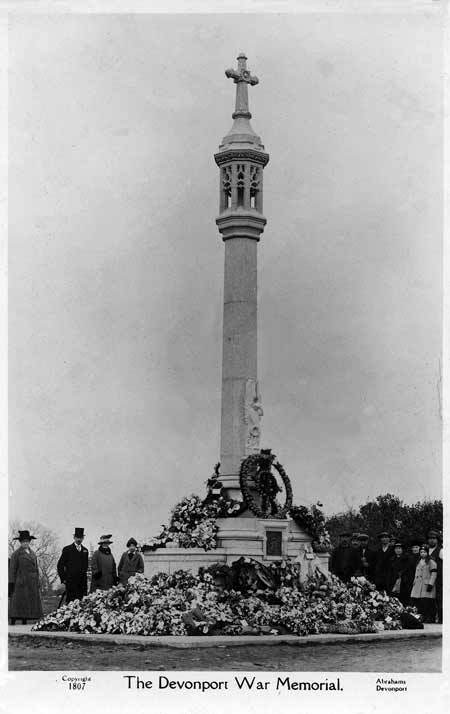 The memorial to the brave residents of Devonport who lost their lives in WWI, commonly called the Great War, was erected in the park on 14 March 1923; it is located near the Exmouth Road entrance. This memorial was unveiled by Field Marshall Lord Methuen GCB, SCMG, GCVO, and is sometimes referenced locally as 'The Methuen Memorial'. Many local dignitaries were present at the ceremony such as businessmen, Police, Armed Forces personnel, the British Legion, Nurses, the Mayor of Plymouth and Lord St Levan. It was Lord St Levan, chairman of the memorial committee, who gave an address ... "it would serve to point the path of duty to those who come afterwards should they receive a similar call". The memorial is a 33 ft high granite column designed by Mr C Cheverton and built by Mr J B Hunt of Plymouth. The column has a lantern and cross upon the top. Lower down there is a marble statue of Victory. On the plinth is a bronze plaque with relief lettering and the Devonport Coat of Arms. A second bronze plaque, on the opposite side, has the emblems of the Royal Navy, the Army and the Royal Flying Corps. The inscription on the memorial reads ... "To the immortal memory of the citizens of Devonport who fell in the Great War". 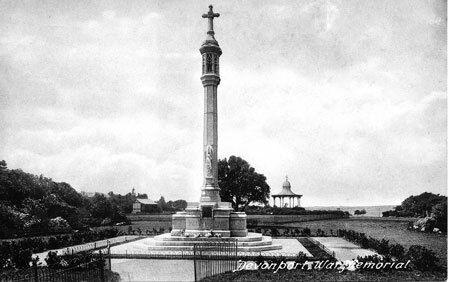 Another postcard of the memorial showing the original bandstand in the background. On 9 November 1998 the memorial became a Grade II listed structure. The figure of Victory, on the lower part of the column, suffered vandalism damage in 2003 and her head and arm were knocked off. In keeping with the rest of Devonport park's restoration project in the millennium decade, the figure of Victory was restored, in 2007. Note: A reader contacted me asking whether I knew the names of the persons commemorated by this memorial. I don't, and having thought about it, I now think it was intended to honour ALL Devonport forces personnel from that war, as opposed to representing a specific list of men. If anyone knows otherwise I'd be pleased to hear from you.